Ah, everybody loves a good dragon. Puff the Magic Dragon, Pete’s Dragon, the dragons in Game of Thrones, How to Train Your Dragon and, of course, the geek-fest that is Dungeons and Dragons. 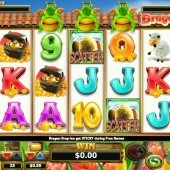 Now, slot developer NextGen Gaming get their hands on the dragon theme with this Dragon Drop slot. 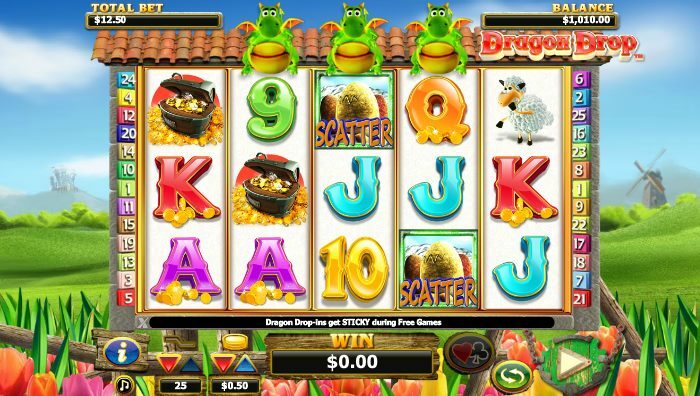 This 5 reel, 25 pay-line slot definitely has a less sinister feel to the dragon theme than Dragon Slot from South American-based developer Leander Games. The symbols are all presented in a comical manner such as the dopey-looking guard, a castle, treasure, a camp sheep and then there’s also the title dragon who sits atop the reels looking a bit on the porky side. He looks happy enough though! The Dragon is Wild... and Drops! The Wild on the reels is also represented by our dragon friend. This Wild can drop onto the reels on any spin and replace a random symbol. This is where the title Dragon Drop comes from! This will then substitute for any symbols, except for the Scatters, to complete winning combinations. Our dragon friend becomes animated and gets all unnecessary when he appears! It is good to see a dragon with a real zest for life! Earn 8 Free Spins... with 2x Multipliers... and Sticky Wilds! You will need to hit three or more dragon’s eggs Scatters across the reels to trigger the free spins bonus round. If you manage to do so, you will be instantly awarded with 8 free spins. All winnings during the free spins bonus round are doubled and any Wilds that drop onto the reels will remain as Sticky Wilds for the duration of the free spins so you could really hit some big wins. Dragon Drop is a nice little slot to play if you have some spare time and don’t want to commit to anything too epic. There is not much depth to this slot with the basic Wilds and Scatters pretty much summing up what can be triggered during this slot but it is enjoyable enough. Dragons have a strong presence in the online slots market so if you fancy some more dragon-themed slots action then I would recommend you try Dungeons and Dragons – Treasures of Icewind Dale by developer IGT or the oriental-themed 5 Dragons by Aristocrat.